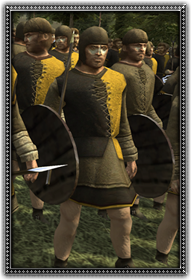 These Lowland Peasant Spearmen are composed of free farmers called up to the service of the cities. Unable to afford armour, these troops fight unarmoured making them soft targets for enemy archers, and not suited to prolonged melee. Nevertheless this unit has had training and can form a defensive circle of spears.